What is your deal, Asparagus? I ate 4 spears of homegrown, organic, purple asparagus the other day. And that might be all the asparagus I get to eat this year from my garden. This really bugs me- I love asparagus. This patch has been growing for maybe 4 years, and I planted another one 2 years ago, and I see no shoots coming up this year at all. What the heck?! What is your deal?! I followed planting instructions, I watered the new bed faithfully, I really want asparagus. The universe should give me what I want, right? I suspect the issue is water. 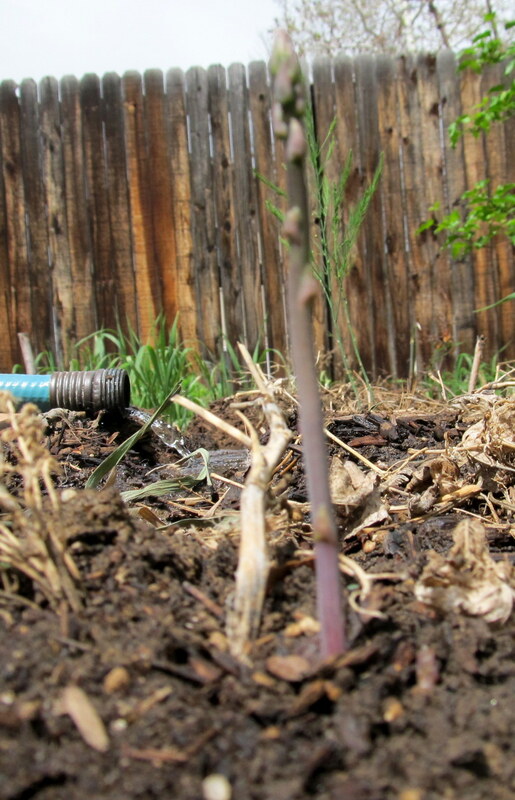 The asparagus that does well around here grows near irrigation ditches and cattle waste lagoons (yeah, that’s what it sounds like). This has been a wet spring, but a dry winter. We do live in a semi-desert. So if I want to grow asparagus here I need to water more, all summer. I think what has been difficult about that is that you only pick asparagus for a few weeks in spring, but it needs water all year, and I have a hard time watering ferny foliage that doesn’t feed me. In my head, I think the ferny foliage should take care of itself. What I came up with last night was maybe I should interplant some things that I do want to eat with the asparagus. Carrots? okay. Lettuce? cool. Beans? okay. I’ll water it like any other veggie garden. it only looks like it is as tall as the fence- that’s just an error in perspective. This stalk is smaller than a pencil. Sigh. So, I’ll try it. I’ll let you know how it goes. Previous Pizza- you can grow that! Next I can’t believe I am spending money on grass! I had to replant my trench when we moved. I’m missing it this year.